New privately-owned airline powdair has launched ticket sales for its winter schedule that will see it linking Switzerland’s Sion Airport with eight destinations in the UK, Germany and Belgium. The airline will be based at Sion in the heart of Switzerland’s winter sport region, the Valais, and offer skiers and snowboarders across the UK, Northern Germany and the Benelux countries the chance to reach some of the world’s most famous winter sports resorts quickly and efficiently. Flights commence on 14 December 2017 and will significantly cut transfer times to some of Switzerland’s most popular ski resorts including Zermatt, Verbier, Saas Fee, Crans Montana and Nendaz. A variety of transfer options from Sion Airport to onward destinations are available to book at the point of ticket purchase, including shared and private journeys to the major resorts in the region. Ticket pricing for powdair will be completely transparent and with very little fluctuation across peak dates, ensuring families won’t feel hard done by during the busier school holiday periods. It means booking up fast, but at little or no extra cost than during the non-peak times. The eight airports that will be served by powdair are: London Luton, London Southend, Southampton, Bristol, Manchester and Edinburgh as well as Antwerp and Hamburg. 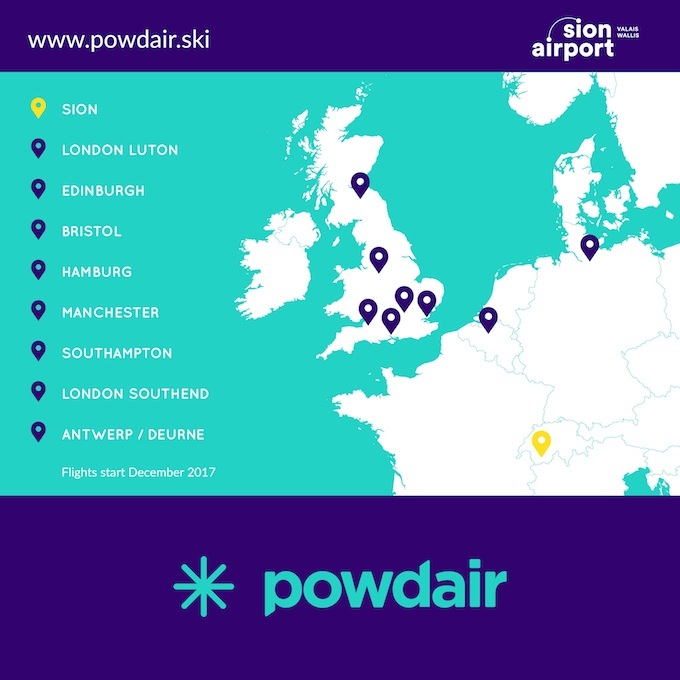 Zoë Ombler, head of Commercial for powdair, said: “It’s not every day that we get to launch an airline and especially one that opens up a completely new route into an airport that is so close to some of the world’s best ski resorts. The response we have already seen on social media shows the kind of interest people have in the area and regular, scheduled flights into Sion are long overdue.